Because of the intense connection we feel with music, we can remember song lyrics even when we have forgotten the details of our personal lives—even when all else fails, a song can transport us back. In this sense, a song is capable of suspending time. 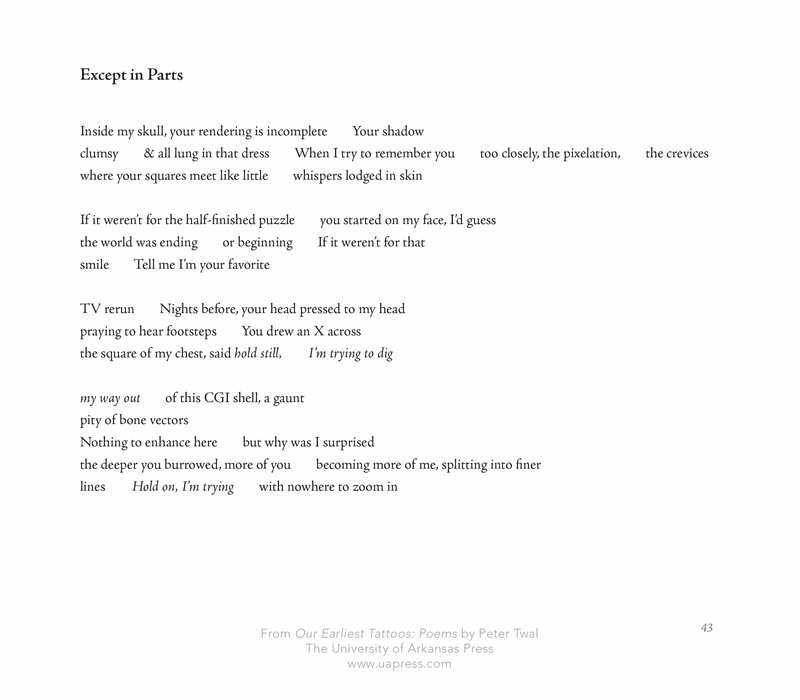 Drawing on this perspective, Peter Twal’s playful, inventive, and wickedly sentimental debut collection takes a set of song lyrics (LCD Soundsystem’s “All My Friends”) and treats them as an artifact of memory itself, blurring the line between self and other, between past and present. 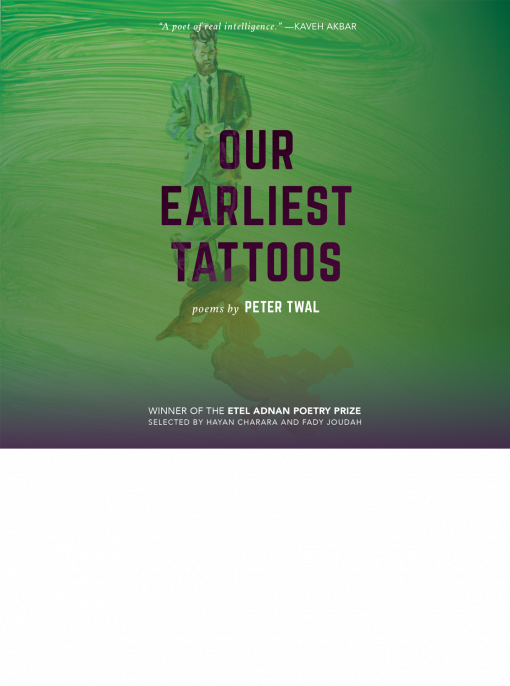 Each poem in Our Earliest Tattoos acts as a passageway from one lyric in the song to the next—the author pries these lyrics open like doors and builds whole rooms between them. As readers progress through the house he builds, they hear the song as the soundtrack to their discoveries: in one room, of party leftovers, and in another, an exploding museum of natural history. Wise, funny, and wholly original, the long-lined sonnets that make up Our Earliest Tattoos celebrate the surreal, embracing the nature of memory as fragmented—as is visible in the fractured nature of the lines—and inherently bizarre. 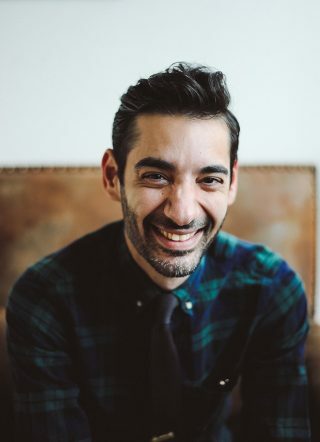 Peter Twal is a Jordanian-American electrical engineer from Baton Rouge, Louisiana. His poems have appeared in Best New Poets, Kenyon Review, West Branch, and elsewhere. He is a recipient of the Samuel and Mary Anne Hazo Poetry Award. 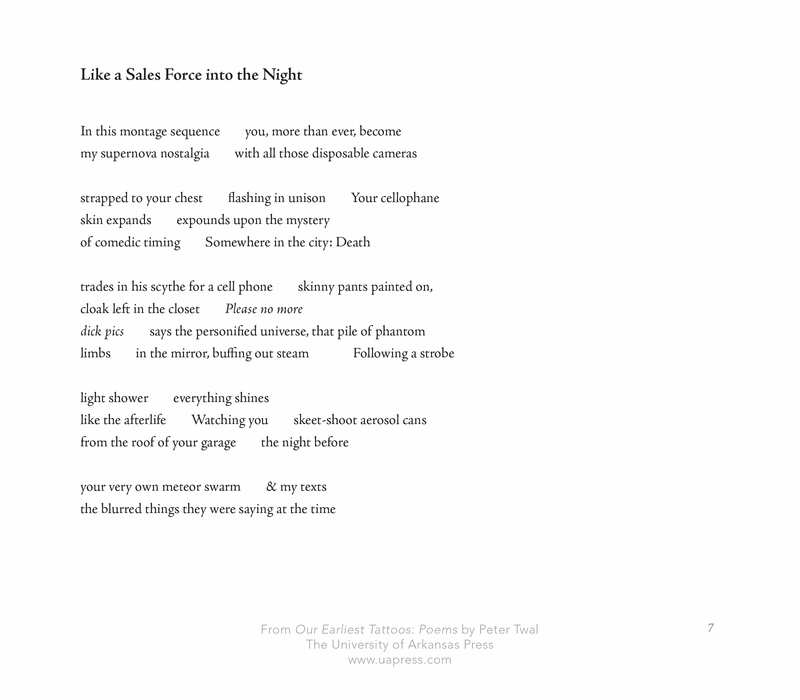 Four Contemporary Poets on Voice and Visibility, Chicago Review of Books. Course Description: This is a course for students who are ready to immerse themselves in the strange contagious waters of poetry. We’ll read across regions, languages, communities, and time periods to connect to poetry’s aesthetic, formal, and political urgencies and possibilities, and we’ll write an array of poems of our own. 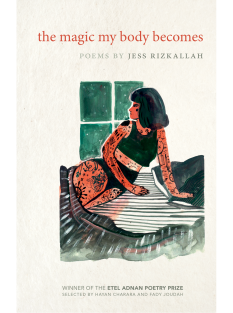 Expect to write individual lyrics as well as prose poems, letters, verse plays, sound poems, collages, remixes, performance pieces, and verse plays, and to poke around in the traditional and digital media by which poems have been shared. Expect to write in- and out-of- class poems, work collaboratively on group projects and translations, present, perform, participate, and offer kind and supportive feedback on peer work., and propose and execute a final project of your own devising. Course Description: This course invites you to build on the basics, develop your technical abilities, and broaden your approaches to the form, genres, media, language, and performance of contemporary poetry. Students should expect to read and view works from a variety of periods and cultures and will generate their own poems in response to course readings and prompts as well as their own impromptu in-class writing. Students will also sharpen their critical vocabulary as they analyze assigned readings, critique peer work, and receive critiques of their poems from both peers and instructor.